Vacations can be expensive! Most families don’t get to go on vacations because they don’t have the extra money. I totally understand this. Family vacations really should be about spending quality time with your family and spouse. You don’t have to go to an expensive resort or the beach to have a successful family vacation. This was our pre-trip photo. Traveling with four kids can be very expensive if you don’t watch out. 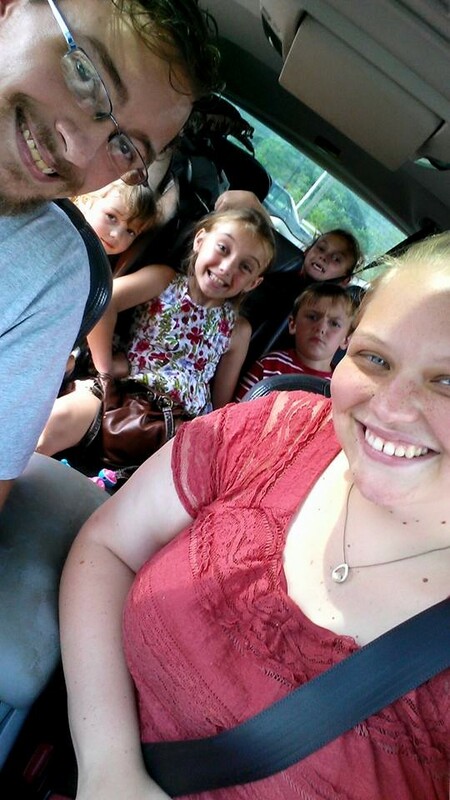 We wanted this vacation to be fun for everyone but for us it was great because the kids are with us for a whole week. The kids had been saying since last year that they wanted to go to a museum. So our top priority for vacation was to take them to one. If you haven’t already…. check out my post A Night At The Cincinnati Museum Center to read about our experience there. I remembered how much I loved the Cinci Museum so we knew we were going to take them there. So vacation location…..check. We were headed to Ohio. Next the decision was where we were going to stay. Abby’s only request was to go somewhere with a pool. 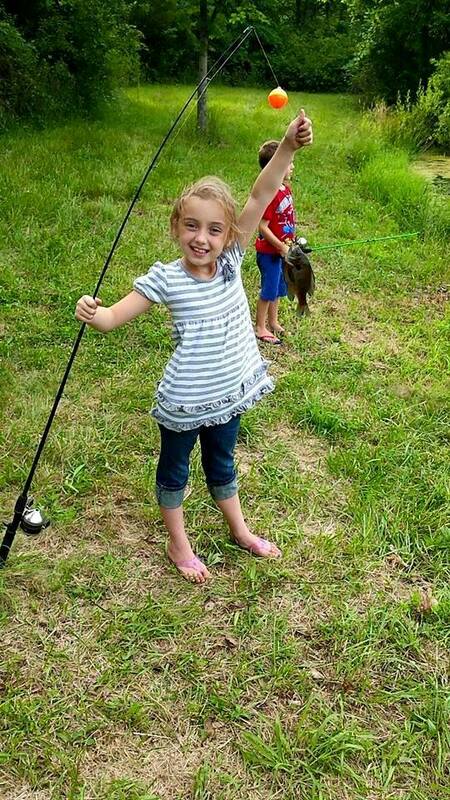 After telling her there was a pond at my dads house she quickly changed her mind. 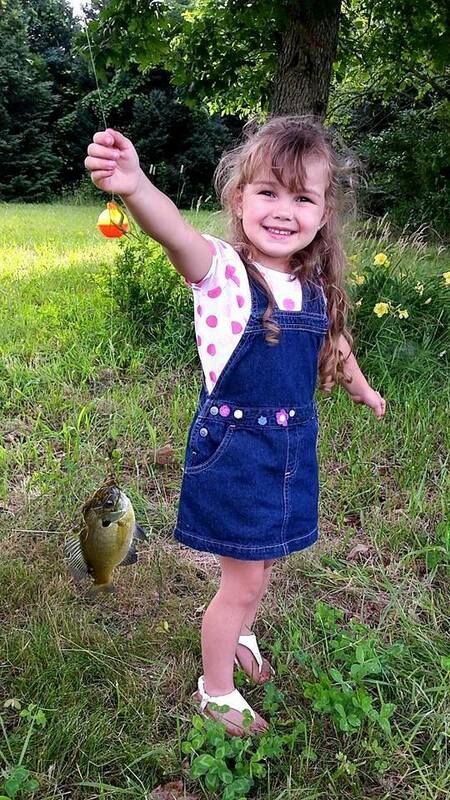 She wanted to go fishing :). My dad lives in Ohio and has a nice big yard for the kids to play in. He is always up for us coming to stay and visit. Not to mention it was FREE. The expense of a hotel was cut out right from the beginning. Vacation home away from home….check. We were staying at Papaw Roger’s house. Dad loved spending time with the kids. 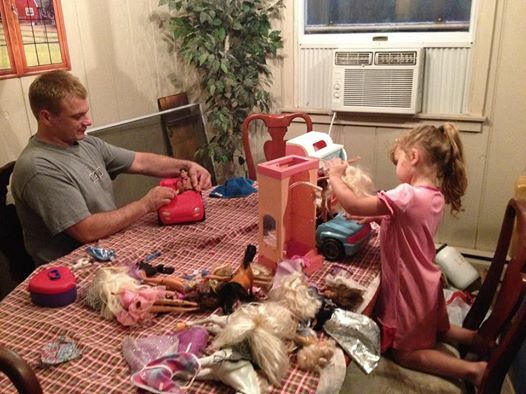 Here he is playing Barbie’s with Savannah. My dad has kept a lot of my childhood toys. He has been wanting me to come get all of it. Savannah is in a big Barbie phase right now. Dad had my old two-story Barbie house, cars, and Barbie’s in the basement. When he brought it all upstairs she fell in love. He got them all out and started playing with her….it was actually really sweet. So not only did Savannah get to have a fun vacation….she got a bunch of Barbie’s and accessories. I have everything from the Barbie shower, to grocery store, horses, even a scuba Barbie. I may have been spoiled lol. Anyway back to vacation. We had the location, home away from home, and first adventure figured out. Now I had to find other stuff to do. I knew my kids would love going to a real castle….so the Loveland Castle it was! If you haven’t already….go read my post The Loveland Castle to see what all we done there. 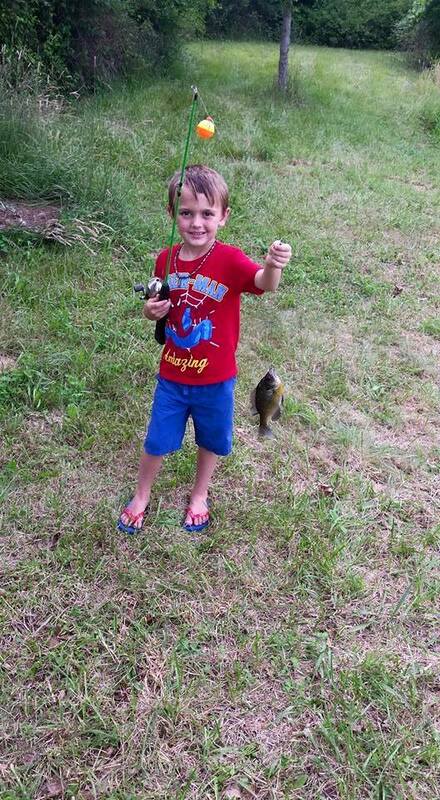 The last activity I knew we wanted to do while on vacation was fish. 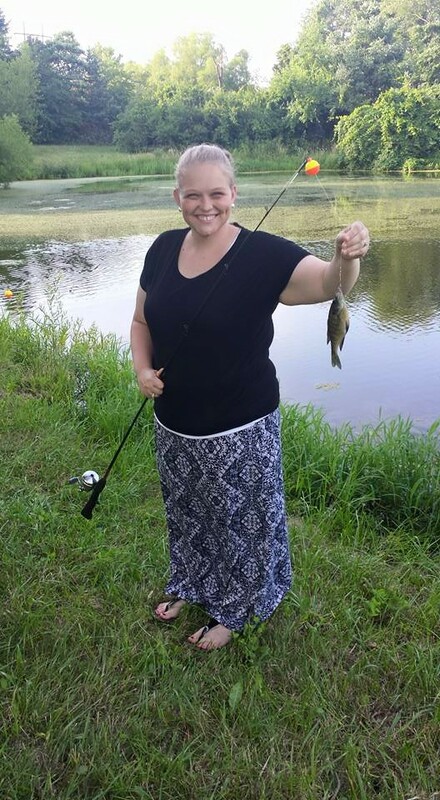 My husband and I love fishing! The pond at my dads is awesome because it is secluded and nice and quiet. There are no neighbors for quite a while and we didn’t have to worry about other people showing up. With all of these activities I had to keep the dreaded word (budget) in mind. It would have been easy to just go hog wild and spend money left and right. However, I try to be a little more responsible than that. I have compiled a list of four things to help with vacationing while on a budget. First off before you leave…know how much money you have to spend on your trip. This is vital for trying to be responsible when it comes to saving money while on vacation. We knew exactly how much money we had for vacation and how much needed to be spent on food, admission into places, gas, and souvenirs. This will help ensure that you don’t overspend in certain areas and run low on money. Find free or low cost activities to do. 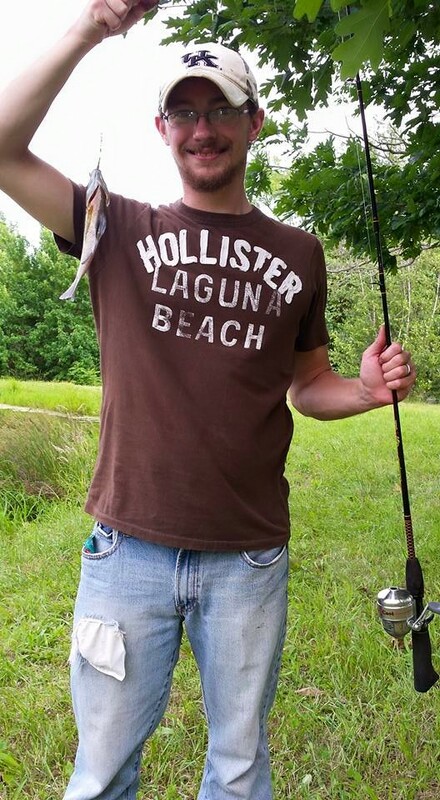 Fishing for three days and countless hours only cost us $5.98 for the bait. My dad supplied the poles and the pond. 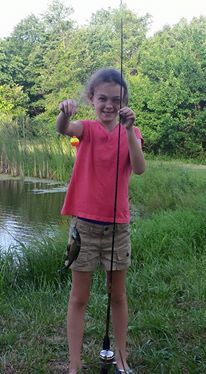 I believe getting to fish may have been on the top of Jeremiah and Abby’s list of fun things they got to do on vacation. The castle cost $5 for an adult and $3 for children 12 and under. To our surprise when we got there Savannah was free. In all the castle cost us $19. Because the castle was smoldering hot we made a pit stop afterwards to get ice cream and shakes at McDonald’s. That cost us $12. Visit the grocery store when you get to where you are vacationing. Cooking instead of eating out will save you a ton of money. Also using store cards at grocery stores help too. I saved around $10 using my Kroger Plus card and Josh saved around $6 at UDF. That’s $16 in savings. As far as fast food we ate pizza one night and McDonald’s on the way home. That’s the only times we ate out during vacation. Not to mention if you cook you can make things the whole family likes. You can even make extra and have leftovers later that night or next day. The first night we made classic summer food….hot dogs and hamburgers on the grill. Then we had pizza the second night and the last night sloppy joes. In all we spent about $115 on food for six people for four days. And we ate pretty good too. Josh figured up that even if we only spent $5 a person (there’s 6 of us) three times a day for only three days that equals $270 before taxes. So we saved at least $155 on food. Lastly, have a budgeted amount for souvenirs. My husband and I didn’t want anything. However, some people do. It’s whatever you prefer. The budget is mainly for the kiddos. Gifts shops are a nightmare for budgets. Small, cheaply made items usually cost around $6! It’s like kids sniff out the most expensive item and they always want it. We had that fiasco at the museum center. Thankfully it was solved real quick. It could have been a disaster but luckily Savannah is easily distracted. The kids had their own souvenir money from their Mimi and Mamaw. That helped a lot! Of course we got them something too. So the kiddos came out pretty good on the souvenir end. These four things helped save us a ton of money while on vacation. I don’t know about you but any money saved sure helps out! I challenge you to try one or even all four of these things when you go on your next family vacation. My name is Kirstie Thompson and I am the mind behind The Southern Pearl. I am an Eastern KY native and currently live in Clayhole, Kentucky. I have five wonderful kids (four bonus/step kids and a biological daughter). I am happily married to my best friend. I absolutely love Kentucky and all things the south has to offer. I'm a very outgoing person and I love to help others. I LOVE all things pearl and lace. Stay around a little while! If you would like to see a certain post or be featured on The Southern Pearl feel free to email Kirstie at kirstiepthompson@yahoo.com. Want to keep up with what's going on with The Southern Pearl? Enter your email address to follow this blog and receive notifications of new posts by email. Visit The Southern Pearl on Facebook Here!